Please note in the comment section What Name you would like to have on the Certificate(s): Who it is To: and Who it is From:. We will e-mail the certificate(s) to you and you can Print it as a gift or we will gladly mail it. 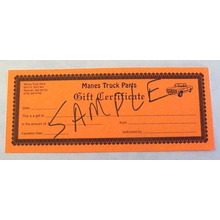 NOTE: The Gift Certificate does not have to be returned to us, nor does it have to be used all at once. Just make a note in the comment section of the new order or call the order in and let us know you would like to use it.